Jorges Luis Borges’ short essay, the title of which translates as “The Analytical Language of John Wilkins,” insists on the inability to ever be able to classify the world, because such a classification as once attempted by the 17th century philosopher John Wilkins would be “arbitrary and full of conjectures.” Wilkins was attempting to create a universal language where the definition of a word would be embedded in the letters themselves, but his attempt was limited and arrogant, or as Borges puts it, full of “ambiguities, redundancies and deficiencies.” Borges’ ultimate point is that we don’t understand the world enough to ever create a unified language, that attempting to is perhaps missing the point entirely. Borges is also attacking the idea behind the encyclopedia, the idea of attempting a kind of absolute knowing, and he uses an example from a possibly fictitious Chinese Encyclopedia titled “Celestial Empire of Benevolent Knowledge,” in which animals are classified into the following categories: (a) belonging to the emperor, (b) embalmed, (c) tame, (d) suckling pigs, (e) sirens, (f) fabulous, (g) stray dogs, (h) included in the present classification, (i) frenzied, (j) innumerable, (k) drawn with a very fine camelhair brush, (l) et cetera, (m) having just broken the water pitcher, (n) that from a long way off look like flies. This passage, rather interestingly, is the jumping off point for Allison Titus’ deeply considered second collection of poems The True Book of Animal Homes. Immediately in this context, the word “true” becomes suspect, Titus, like Borges, is questioning received truths, as well as proclaimed authorities on subjects. The subject Titus is most interested in is the animal kingdom, within which, humans fall. 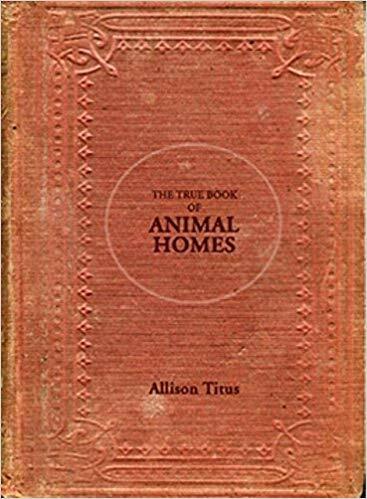 Here, the abuse of animals, the hunting of them, working of them, and slaughter of them comes into question; but Titus doesn’t stop there, she releases the animal spirit across these pages to bring to light how little we understand about animals, and therefore, about ourselves. The poem seems to ask: what is the measurement of our own worth? Of days spent in such ways, in order to keep something running, perhaps ourselves, but often something very distant from our true selves. In the last poem of the office section, “They Are Taking The Animals Out Of The Offices,” there is no longer any distinction between the animal and the human, this system of classification is defied. Badges are removed from chests and the animals are cut from their monitors, they test out their “rabbit lungs,” they are “done with this industry” with “the supply and demand of it;” Titus writes they leave the offices “one by / one / & they run / & they run / & they run / & they run / & they.” The section ends abruptly, leaving what “they” do after this to the imagination. The final section of The True Book of Animal Homes is composed of a series of poems titled as essays. In this section, the poet seems to step back, and yet, the poems become more intimate, even at times, personal. Here is another way that Titus defies formalism and categorization, as throughout the book it must be noted that poems spread across pages, are spaced in various ways, and words are clustered and then dispersed. Though the collection itself is rather tightly organized, one could say the poems refuse to be contained, to settle into any received form. The essay poems are on subjects such as urban homesteading, economies of scale, the body, and vibrant matter, but they continue the work of the previous sections through another approach. In a way this formal gesture recalls Borges’ suggestion that there can be no universal language because of the different ways in which we can approach a single subject, here that subject is ultimately the human/animal connection as it relates to the human/animal divide. Is the body animal? Allison Titus asks us to consider the possibility that it is animal. Within this slippage between human and animal there is the possibility of something marvelous, something closer to a true home.